Should I Buy a Timeshare? Are one of the very few lucky folks who has access to the Internet while in the middle of a timeshare sales presentation. Know someone who owns a timeshare and are wondering if it would be good for you. Are looking for a cheaper, smarter, or more comfortable way to enjoy a yearly vacation. With all the horror stories associated with the timeshare industry, you’d be wise to do plenty of research before committing to this lifetime obligation. In fact, most timeshare contracts will outlive you and impose burdensome financial demands upon your children after you’re gone. Clearly, timeshare ownership is nothing to jump into and certainly nothing to take lightly. While there was a time years ago when owning a timeshare may have been a great way to lock in an annual family vacation at a somewhat reasonable cost, those days are most definitely gone for good. The unfortunate situation is contemporary timeshare resorts have been overrun by greed and shady sales tactics. The situation has become so dire that legislation has had to be passed in nearly every state in America to protect the public from less-than-ethical predatory timeshare salespeople. As well, state and federal law enforcement agencies have found timeshare resale scams at the top of their lists of consumer complaints. Known for high-pressure sales methods and creative coercion, timeshare sales people are the slickest, most manipulative hucksters in operation today…even overshadowing used car salesmen by reputation. If this is the case, why do people still ask that fateful question, Should I buy a timeshare? There are many reasons that people put pen to paper and seal a timeshare deal that could literally cost them hundreds of thousands of dollars over their lifetimes. Why Do People Think They Should Buy a Timeshare? They think it’s a good investment. They want a vacation home, but cannot afford to buy a second home of their own and/or do not want the responsibilities. They think they can get out of it easily. They plan to cancel before the rescission period is up. They think buying a timeshare is a good way to “spoil themselves” or think of it as something they “deserve” for all their hard work all year. They feel guilty for having received a “free gift” or free vacation from the resort. They think it will “force” them to take a vacation each year, no matter what. They think it will be good for their marriage or family relationships. They feel pressured or emotionally blackmailed by timeshare salespeople. They get caught up in the moment, enjoying their vacation so much they don’t want it to end. 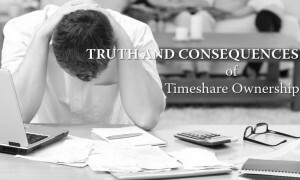 Most timeshare owners find all of the above reasons and beliefs to be erroneous once the many fees and obligations of timeshare ownership kick in. Maintenance fees they were told would only rise minimally from year-to-year, rise significantly. They get hit with special assessments and tax bills they did not anticipate or figure into their financial budgeting. Reserving weeks they need to coordinate with their time off of work is impossible. Ease of use was merely a verbal selling tactic and not the reality of timeshare vacation booking. Life situations change; health problems arise, jobs are lost, marriages break up, and suddenly they are no longer able to or interested in using their timeshares. They find not only is it difficult to get out of a timeshare, it is nearly impossible to resell for a price anywhere near what they paid. The option they were promised of renting their timeshare through the resort never works out or doesn’t put any real money in their pockets. Resorts are only interested in selling and renting their own inventory. The resort not only refuses to buy the timeshare back, they try to convince the timeshare owner that the solution to all their problems is buying a higher level of membership or more points/weeks. Rather than being the good investment they were led to believe it to be, their timeshare is nothing but a liability that has little to no resale value. If all of these negatives outweigh the positives of timeshare ownership, are people still buying them? Unlike you (hopefully), people who buy timeshares do not make the time to educate themselves about the pitfalls of “vacation ownership.” In fact, ARDA (the American Resort Development Association) issued a report claiming that timeshare sales were up by 11% from 2012 to 2013, with over 8.5 million timeshares owned in the United States alone. Within that time, the average timeshare sales price climbed by 9% to over $20,000. Another study revealed that timeshare resorts invest an average 50% of the selling price of timeshares in marketing budgets alone. The truth is resorts are confident in spending huge amounts of money on free incentives to bring potential buyers to timeshare presentations because they know that once vacationers are under the control of the resorts’ highly trained army of salespeople, the ROI will be worth it. Timeshare sales presentations are notorious for promising a 90-minute duration, and then keeping attendees for 3-4 hours…without food or a break. Weary and desperate to get back to holiday fun, vulnerable vacationers sign on for ownership that can last a lifetime based a song and dance that rarely is reflected in the final contract. The answer to your original question, Should I buy a timeshare? is a definitive “No!” With the advent of the amazing travel deals online at one of the many discount travel sites totally negates the “benefits” of timeshare ownership. With timeshare ownership, there is NO real investment value. There is NO guarantee of being able to vacation when and how you want. There is NO way for you to be sure that what you own now will even be useable as the resort changes policies as the years go by. How to Get “Unstuck”…The Timeshare Exit Strategy You Need! Hopefully, you found this article before becoming one of those who asks the question, Why did I buy a timeshare? 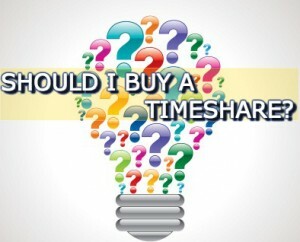 If you did buy a timeshare before asking, Should I buy a timeshare? and now need an exit strategy, fill out our online contact form or CALL TOLL FREE NOW at 888-743-9051.